When Yours Truly KJS broke the news in October via elobeatlesforever (elobf) that a second Roy Orbison album with The Royal Philharmonic Orchestra was on the cards, the only question in this writers mind was what songs would be stripped down and reassembled this time around following on from the impressive commercial success of "A Love So Beautiful" last year. "Unchained Melodies" was finally unveiled on Friday 23rd November replete with a significant promotional fanfare across most media platforms whilst I looked forward to receiving a copy of the CD to review. A cursory glance at the fifteen tracks on offer revealed an interesting mix of covers and original Big O classics including a quartet of songs from 1989's "Mystery Girl" and Roy's unique take on the likes of "Unchained Melody", "The Great Pretender" and (surprisingly) "Danny Boy". The result is a much more sedate affair overall than its predecessor but one which manages to highlight that amazing voice all the more. The new arrangements for the familiar "She's A Mystery To Me", "Careless Heart" and Elvis Costello's "The Comedians" work well, as does the whole package. The Jeff Lynne connection is here again with the wonderful Orbison/Lynne/Petty penned "California Blue" sounding majestic with its new stringed backdrop. My fave moment has to be "Heartbreak Radio", a rockabilly rocker originally reconstructed by Jeff for the "King Of Hearts" album but revelling in its new orchestral surroundings and given a new lease of life with a real ELO feel to it. The alternate version featuring a duet with Cam also rocks! 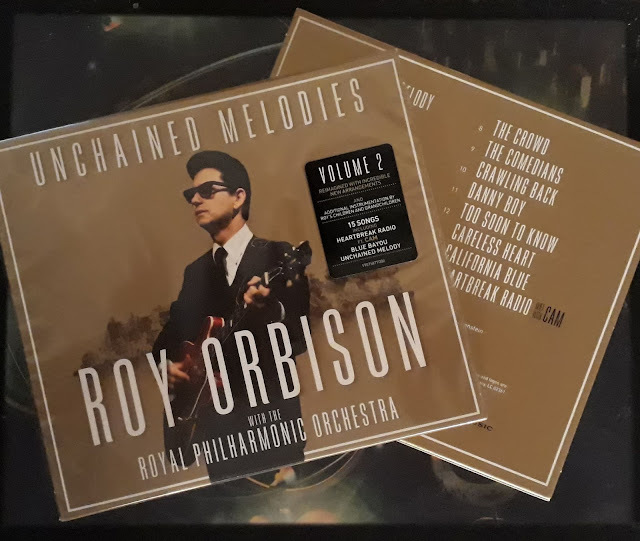 elobeatlesforever (elobf) recommends "Unchained Melodies" by Roy Orbison with The Royal Philharmonic Orchestra to those enlightened folks who enjoy the music of ELO, Jeff Lynne, The Traveling Wilburys, Roy Wood, The Move, The Idle Race, 'Brum Beat', The Beatles and related artistes. Ill have to pick this up. Danny Boy on its own has me wanting it. Orchestral music to me is pure music. It was the thing that attracted me to ELO in the first place. When combined with voice's like Roy's, Elvis or The Beach Boys these Royal Philharmonic albums become a must. I am a Roy Orbison tribute show of some 45 years standing.I spent a small fortune obtaining the new orchestral backing tracks,music etc to present my show with these amazing arrangements of Roy's original hits.The response so far has been very mixed,some people love them,and some people hate them.Apart from the new Heartbreak radio I don't think I'll use anymore new versions.I personally love all the new stuff! !.Any help out there.